I'm a UC Blog » Google Chrome OS, surely not a big deal for Microsoft? Google Chrome OS, surely not a big deal for Microsoft? 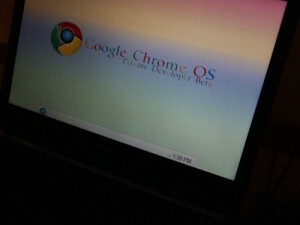 The blogosphere is going nuts about Google’s recent announcement to launch a Netbook friendly OS aka Google Chrome OS. Personally I don’t get what the deal is about, from what I can tell from the leaked picture below this is just another variant of Linux, like Asus’s Xandros and as we all know it didn’t take long before both Asus and their customers decided to jump ship for, yes you guessed it Windows XP. I really don’t see how this is a threat for Microsoft, sure it has a big company name behind it, but not everything Google puts its mind to is a success. Look at Android, this is a device that needs to be charged bi-daily, every blog/podcast I read/listen to e.g. This Week in Tech, slams it for its lack of usability. Next there is the Chrome browser, put your hand up if you can use this for more than one day – it is not compatible with the internet so far as I am concerned. Google ARE good at what they do, with this I am referring to cloud based services like search, gmail, analytics etc. Can you tell me one non-cloud based service that has been a big success? The moral of this story…I don’t see this as a threat to Microsoft or Apple and it’s board (earlier today there were claims that Chrome OS will force Eric Schmidt off the Apple board). I see Chrome OS a threat to the Ubuntus of this world and nothing more…..